An individual who lives in the immediate area of this grave informed me about this Union soldier’s final resting place. He has hunted the surrounding woods almost all of his life and has known of its location for many years. According to this person, there was an attempt to excavate the grave by a person/persons probably looking for Civil War relics. The person/persons digging in the earth, dug down about four or five feet deep. By most grave standards, the headstone is always placed to the west of the gravesite. It appears that they didn’t know on which side of the headstone to dig. There has been no evidence or rumors of anything being found since it is believed they dug on the wrong side. The gravesite is located approximately 2 miles north northeast of Cloverdale, Alabama. It is on private property and quite a ways off a road. It would be helpful to visit with the land owner before going on the property. The headstone was removed from the gravesite in the 1980’s and was gone for about two years. Suddenly, it was returned and placed in the exact spot with the lettering to the west as originally placed. 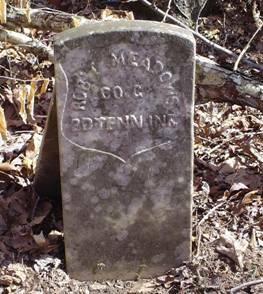 According to the inscription on the stone, Meadows was attached to Company “G” of the 2nd Tennessee Infantry. But he is listed in the Company “D” roster, of the 2nd Tennessee Infantry, also a Union Army unit. He enlisted at Savannah, Tennessee on January 15, 1864. He was mustered in February 1, 1864 at Nashville, Tennessee.